3 v. : ; 27 cm. States, the District of Columbia, and Puerto Rico) by air. Customs districts) through which air shipments were made. January 1, 1974 edition, as amended. United States to foreign countries. The statistics, therefore. equivalent to the f.a.s. 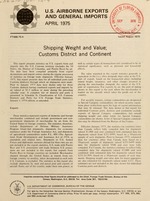 (free alongside ship) value at the U.S.
placing the merchandise alongside the carrier at the U.S.
ities may be obtained from the Bureau of the Census. $300,000 and over Less than 2'. of the totals less than 2e. chandise by air from foreign countries to the United States. into Puerto Rico from foreign countries are included. significance, such as personal and household effects. a value in the foreign country, and therefore excludes U.S.
and frequently does not reflect the actual transaction value. the aircraft which brings the goods to the United States. $251 and over Data for shipments valued under $251. generally have a sampling variability of less than $50,000. more than for the dollar value figures. possibility of errors which may arise from various sources. to the fullest practicable extent. ;r.l.ppir. .|I.hf II O'O0 pouno s.
All I i. fI., Oc.anI. rj. 't lLL- TF.r dN AsE . 53 E 0ILiA, S, TE. a .. .
8? "M'..r AuL tL, aLA lS . I-. 6- rj .h E F i TM a. .iA. .
103 rlAC7TOi, 0"[':' . ? *i la la nn .001 poac.da or L.aO. U.S. FLAG CARRIERS . .
CHAMPLAIN-ROUSES POINT, N. Y. .
BUFFALO, NEW YORK. . '. BUFFALO-NIAGARA FALLS, N. Y. .
NEW YORK CITY, NEW YORK. .
NEW YORK, NEW YORK .. .
JOHN F. KENNEDY INTL. AIRPORT. .
WILMINGTON, NORTH CAROLINA .. .
BEAUFORT-MOREHEAD CITY, N. C. .
LITTLE ROCK-N. LIT. ROCK, ARK. .
- .. ..1 I r r.,- -o'.=r . 57 TEX. i CIT, TES . 65 SAN DIEGO, CALIFORNIA 2 2 2 . 102 TURNER, MONTANA.., Z. Z . (Z) Leas than 500 pond or 100.